A Companion to Science Fiction assembles essays by an international range of scholars which discuss the contexts, themes and methods used by science fiction writers. 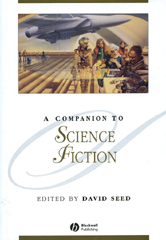 This Companion conveys the scale and variety of science fiction. Shows how science fiction has been used as a means of debating cultural issues. Essays by an international range of scholars discuss the contexts, themes and methods used by science fiction writers. Addresses general topics, such as the history and origins of the genre, its engagement with science and gender, and national variations of science fiction around the English-speaking world. Maps out connections between science fiction, television, the cinema, virtual reality technology, and other aspects of the culture. Includes a section focusing on major figures, such as H.G. Wells, Arthur C. Clarke, and Ursula Le Guin. Offers close readings of particular novels, from Mary Shelley's Frankenstein to Margaret Atwood's The Handmaid's Tale.